Work, family, and other outside demands competed with schoolwork and often led to a student's decision to drop out of school. Use online learning to address at-risk students' needs and increase student achievement. Decrease dropout rate and increase graduation rate. District leaders selected Apex Learning online courses because of the rigorous, standards-based content. Use digital curriculum for online credit recovery in both blended and virtual learning environments to reengage students who have dropped out or are at-risk. 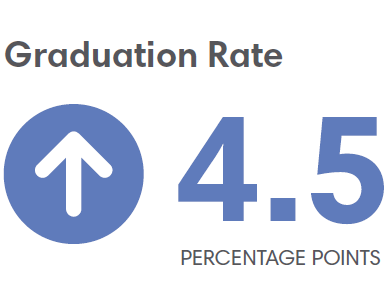 * Graduation rate increase calculated over two years. Too many high school students in the Auburn School District were falling behind. For many, a history of limited academic success had eroded their confidence. Life demands outside of school frequently competed with schoolwork, which often led to the decision to drop out of school. District leaders needed a way to provide a flexible learning environment to address these students' needs. Using Apex Learning Comprehensive Courses, Auburn established an online credit recovery program. One of the challenges of any credit recovery program is that each student starts at a different point and has a unique set of needs. Some require remediation in basic skills before they can tackle high school coursework. Others need only to recover a few credits in order to graduate. Still, when given the opportunity to work at their own pace, some students can accelerate through the material. In fact, one teen in the district accelerated his graduation in order to join the Marines while maintaining a full-time job to support his family. Apex Learning online courses are rigorous in content and match well with our core curriculum. Without Apex Learning digital curriculum, many seniors would not have had a chance to graduate on time. In this blended learning environment, Apex Learning Comprehensive Courses provided direct instruction and formative and summative assessment, while the classroom teacher used real-time data to monitor student progress and performance and determine the best way to help each student achieve. Based on the data, each student received an individualized plan that mapped his or her learning path toward graduation. Students focused on specific content they have yet to master and move at their own pace. For students who needed flexibility in their learning to meet other obligations - from raising a child to working full-time - Auburn offered a virtual learning program. The district allowed students to work online from home, and expected to each student to participate a minimum of 25 hours online each week. Students enrolled in one course at a time and gained confidence as they successfully completed their coursework. Since the program's inception, both student achievement and the graduation rate have steadily increased with fewer students dropping out. District administrators credit the program for reaching many students who otherwise would not have graduated. As a result, Auburn School District expanded the Apex Learning online program to include daytime and evening credit recovery programs and a virtual school option for original credit.